One For All SmartControl remote does it all | What Hi-Fi? Its SmartControl technology enables the user to program multiple macros, allowing you to control several devices simultaneously. For example, press the 'Watch Movie' button and you can control the volume on your TV as well as the functions of your DVD/Blu-ray player and AV amp at the same time. Similar pre-programmed buttons for 'Watch TV' and 'Listen to Music' enable you to manage all the main functions of your AV equipment from one command. 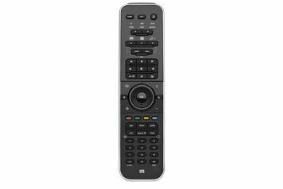 The remote knows which commands to send to which device – so you no longer have to switch between device modes or several different remotes. It also features SimpleSet, a three-button set-up system for all the most popular brands of electronics. This means you don't have to search for code numbers when registering the remote with your hi-fi or AV equipment. One For All's SmartControl is available now for £25 from Argos and Comet.